The popular open fronted storage system is designed for instant visibility of and access to stock. The system is available in a variety of colours and includes vista bins, racks and trolleys, galvanised louvre panel bins, louvred racks, louvred trolleys and cupboards with bin storage. Galvanised Vista Bins - in a variety of standard sizes. 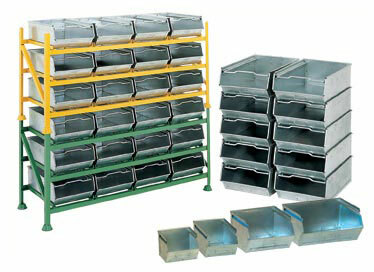 Vista Bin Racks - also available as stacking units. Vista Bin Trolleys - for ease of stock movement. Galvanised Louvre Panel Bins - open fronted small parts storage. Louvred Racks - single or double sided. Louvred Trolleys - for ease of movement, includes workshop trolleys. Louvred Worshop Trolley - with lockable cupboard. Cupboards with bin storage - with security locking system. For more detailed information click on the link below to download pdf of brochure pages.